Aberfoyle is a testament to the early power of literary tourism. Until 1810 it was a small village with a bridge over the River Forth and some slate quarries (yes, the same River Forth that ends up as a major east coast Firth). Though there had been an ancient settlement here on the site of the fortress built by Aedan, Prince of the Forth in the 500s, it was not on a through route to anywhere in particular, and would probably have remained small and fairly inconsequential. Sir Walter Scott changed all that. He published The Lady of the Lake in 1810 and tourism in the Trossachs quickly increased by 500%. As a gateway to the area, Aberfoyle was transformed during the 1800s into a desirable Victorian watering hole. In 1882 it became the terminus of a branch railway specifically intended to service the tourist trade. And in 1886 its attraction was increased further when "The Duke's Road" was built to connect Aberfoyle with Loch Achray to the north and form a link with the road into the Trossachs from Callander. The Trossachs are often described as "Scotland in miniature", an area of lower mountains and lakes extending east and north from Aberfoyle to Callander, and reminiscent of the English Lake District, which was also seeing a tourist boom in the 1800s. Whether the Trossachs would have achieved their fame without the influence of Sir Walter Scott is debatable. For some they are just the foothills of the real Highlands: for others they remain the most attractive part of Scotland. Slate mining remained important even after the arrival of the tourists. By the end of the 1800s the four quarries to the north west of Aberfoyle together comprised Scotland's third largest source of slates, with 1.4 million being produced each year. Perhaps the high point of the industry came in the 1930s when slate from Aberfoyle was used for the billiard tables on the luxury liner Queen Mary. But demand for slate declined and the railway to the quarries was closed in 1947, to be followed by the quarries themselves in 1958. 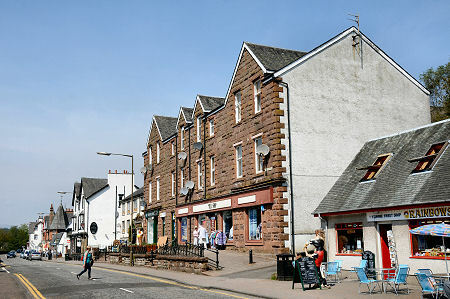 Today's Aberfoyle has been unfairly described as "rather more car park than village", though it is true that its very popularity can overwhelm it at busy times. 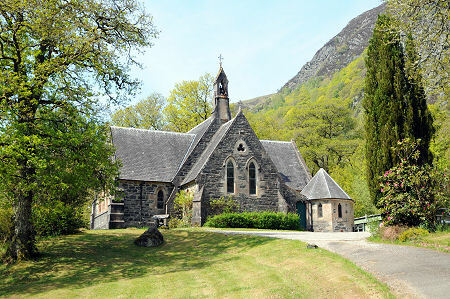 The village serves as the southern gateway to the Trossachs for motor-borne tourists (the branch railway is long gone). It is also the point from which a minor single track road extends north west to the east side of Loch Lomond at Inversnaid and the west end of Loch Katrine at Stronachlachar. Aberfoyle has a lot to offer, though it makes a more rewarding visit at less busy times. And while in the village keep a lookout for the Poker Tree. 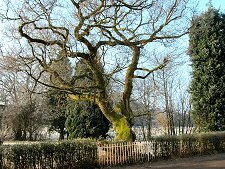 This is an oak tree close to the main crossroads at the west end of the village, from which is hung a poker. This dates back to an incident in Sir Walter Scott's novel Rob Roy in which Bailie Nichol Jarvie makes use of a poker in a fight with Highlanders in an Aberfoyle inn. 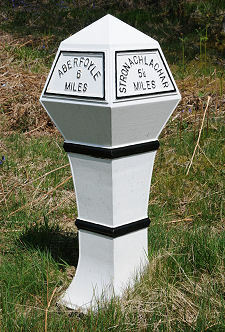 The real Rob Roy had much to do with Aberfoyle and the connection is celebrated by the 79 mile Rob Roy Way which passes through Aberfoyle on its route from Drymen to Pitlochry. 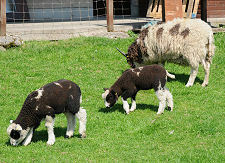 More conventional visitor attractions include the Scottish Wool Centre, offering shopping, eating and animals; and the Trossachs Discovery Centre, offering a wide range of visitor information about the area. Three miles to the east of Aberfoyle is the beautiful Lake of Menteith, where the tranquil ruins of Inchmahome Priory stand on an island. A mile north of Aberfoyle is the The Lodge Forest Visitor Centre, operated by the Forestry Commission.